Coral snakes are generally small (2 to 3 feet), brightly coloured snakes which are not as venomous as the other elapids or viperids. · Coral snakes are generally small (2 to 3 feet), brightly coloured snakes which are not as venomous as the other elapids or viperids. They are considered rare, which may be more due to their secretive nature than actual rarity. These snakes are quiet and very rarely bite. Many authorities consider them harm-less, but they can cause fatalities. They feed on cold-blooded animals. · There are 9 varieties seen in India, of which the commonest is the Common Indian coral snake or Gunther’s coral snake (Hemibungarus nigrescens). It is found in the hills of Western and Southern India, and has nocturnal habits, but little in detail is known about it. When found, which is rare, it is usually located under leaf litter, soil, or underneath rotting logs. It is a reddish or brownish snake with spots or lines on the back ( Fig 12.15). The head and neck are usually black. Other coral snakes are even more rarely encountered in toxicological practice. · The venom is predominantly neurotoxic, as in the case of all elapids, although fatalities have not been reported in India. 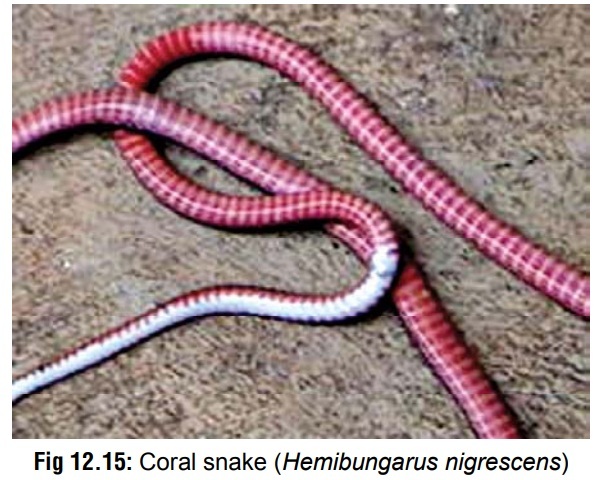 Some tribals report considerable bleeding following presumed coral snake bites.